The Catholic church have asked God to ruddy well pull his socks up and stop making gays, as the synod on family issues opens this morning. 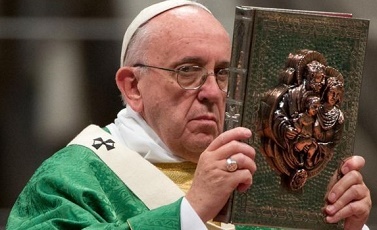 A spokesman for the Vatican said that God was being irresponsible and according to the esteemed book of Leviticus would risk being severely punished by himself. “If he insists on making anything up to 10% of the population gay then we may have no choice but to excommunicate him. And that could mean us not rambling on at him in Latin once a week, so he better take heed” He told us. The book of Leviticus, which also rules against eating shellfish and bumming a rhino on a Thursday, clearly dictates that a man should not lie with another man unless it is on bunk beds in a youth hostel after a days ruddy cheeked rambling. “If God himself doesn’t take notice of this then people are just going to think Mr Leviticus has made the whole thing up.” One angry cardinal explained. The pope is thought to be wearing a long white dress with smattering of Gold and matching accessories. “He does it so effortlessly” One Bishop told us.